Welcome to my Gallery Page. Use this page to browse through my gallery items. Several of the newer items may still be available for sale. You can also visit the Shop to view and purchase a number of smaller items directly. Use the button below to request further information on availability, pricing, shipping, or other questions you may have. Thanks for visiting! Featuring the native american butterfly symbol is still one of my favorite designs. Approximately 16” x 14”. Brazilian Cherry with various other hardwoods and veneers. For this project, I used a variation of a native american rug pattern. Approximately 16” x 15”. Aniegre with various other hardwoods and veneers. 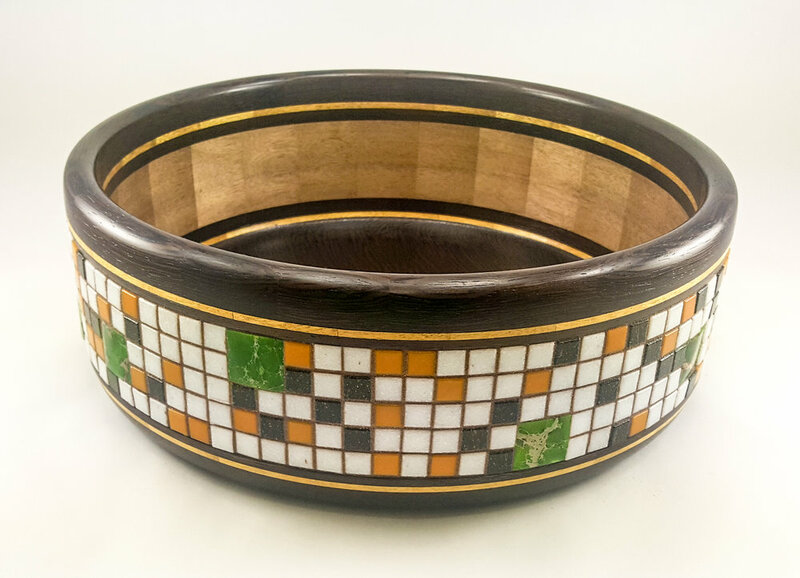 One of the “doughnut” designs I have used on occasions… This one includes a green ocean jasper stone inlay. Approximately 9” x 2.5”; Bird’s eye Maple & Wenge. Size: Approximately 8” x 10”. Materials: Brazilian Cherry, Bolivian Rosewood, Canadian Maple, Burmese Blackwood. The design for the center pattern was taken from a Navajo rug that I photographed in Santa Fe several years ago. Size: Approximately 13" x 9.5". Materials: Brazilian Cherry, African Padauk, Spalted Tamarind, Bolivian Rosewood; Turquoise-blue Howlite. This is another example in which I combined wood with semi-precious stones. Size: Approximately 11” x 10”. 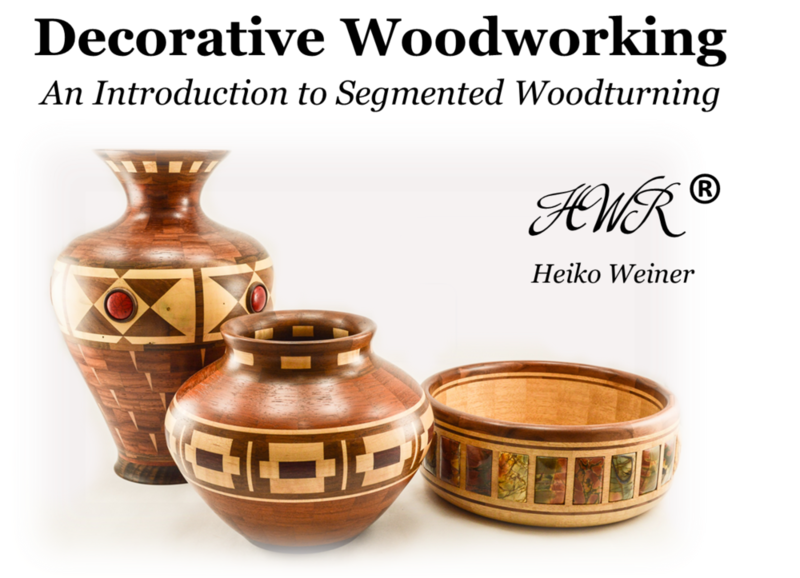 Materials: Aniegre, African Padauk, Wenge, var. veneers. One of my favorite designs by the late Ray Allen. I very much shared his connection to the south west, and still do. Size: Approximately 9.5" x 10". Materials: Tigerwood, Gaboon Ebony, Bolivian Rosewood, Honey Mesquite, Black Walnut. 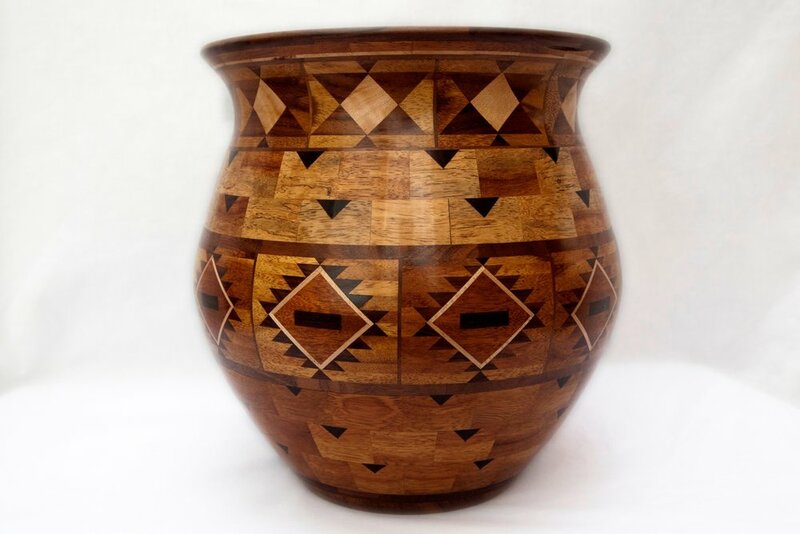 A traditional vessel with southwestern decor. I incorporated several native designs in this one. Size: Approximately 12’ x 4”. Materials: Aniegre, African Padauk, various ceramic tiles, Red Ocean Jasper. 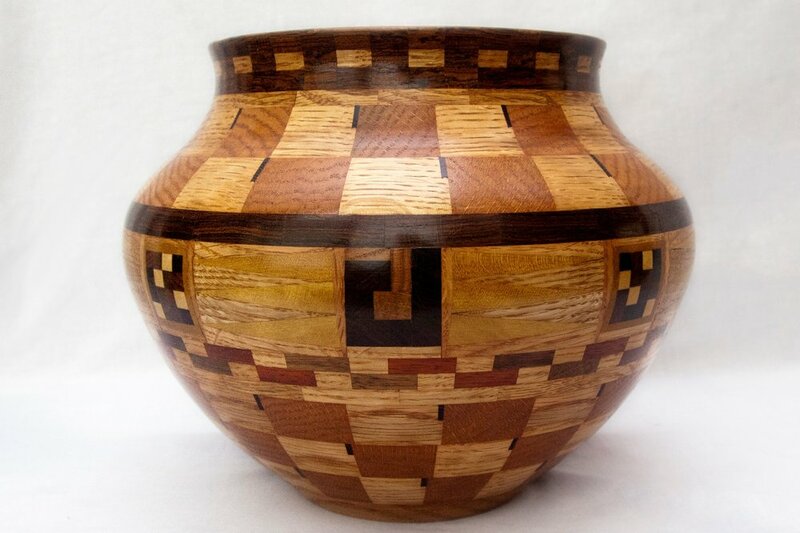 Combining different materials into turnings has always been intriguing to me. Size: Approximately 12’ x 4”. Materials: Aniegre, Wenge, various ceramic tiles, Green Ocean Jasper. Size: Approximately 10.25" x 3.75". Materials: Wenge, Aniegre, Padauk, Bird’s Eye Maple, var. veneers. Another design where I used some of my favorite traditional southwestern decors. Size: Approximately 14.5" x 9". Materials: Hard Maple, Gaboon Ebony, Bolivian Rosewood, Honey Mesquite. 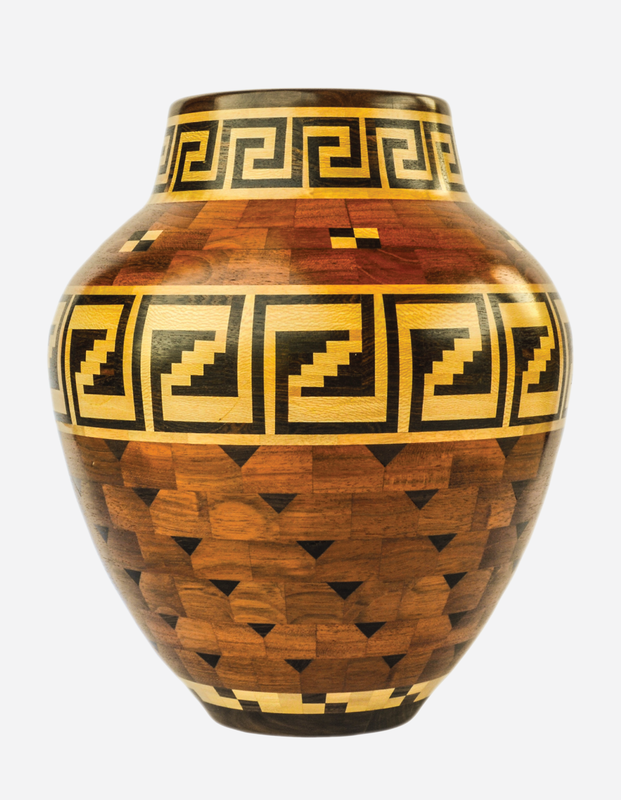 This is a segmented wooden vase with some traditional native american designs. Size: Approximately 6.5" x 19". Materials: Wenge, Padauk, Yellow heart, various (12+) other exotic woods; with Sleeping Beauty turquoise. More than a dozen different hardwoods were used for this design. Size: Approximately 8.5" x 14". Materials: Katalox, Wenge, Aniegre. 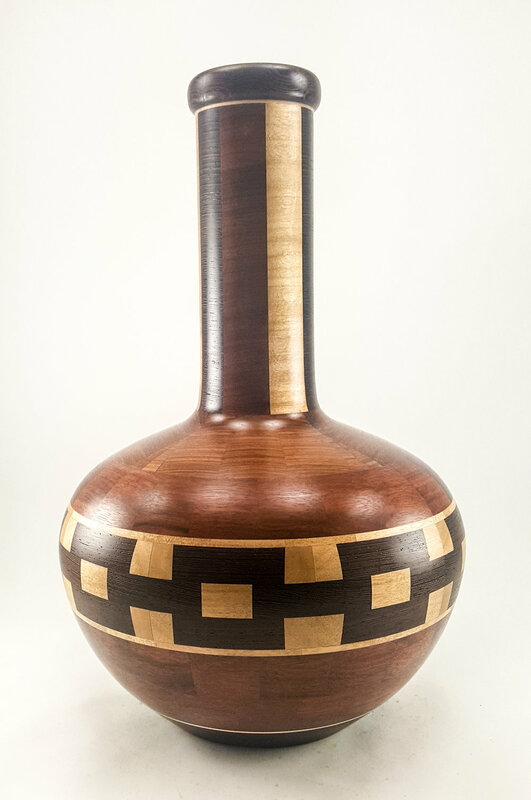 The vase was made mostly from Katalox, a nice beautiful, dense and heavy hardwood, and I added a bold “chain” of Wenge to it. Size: Approximately 8” x 8.5”. Materials: Various domestic and exotic hardwoods (Red Oak, Bubinga, Yellowheart, Ebony, Maple). I used a traditional, pottery-derived native american bowl shape & various patterns for this one.